Catanzaro, M.; Boguña, M.; Pastor-Satorras, R.
Uncorrelated random scale-free networks are useful null models to check the accuracy and the analytical solutions of dynamical processes defined on complex networks. We propose and analyze a model capable of generating random uncorrelated scale-free networks with no multiple and self-connections. The model is based on the classical configuration model, with an additional restriction on the maximum possible degree of the vertices. We check numerically that the proposed model indeed generates scale-free networks with no two- and three-vertex correlations, as measured by the average degree of the nearest neighbors and the clustering coefficient of the vertices of degree k, respectively. 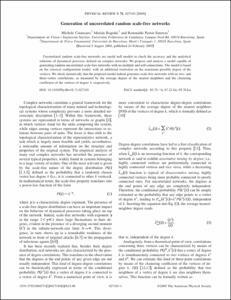 Catanzaro, M., Boguña, M., Pastor-Satorras, R. Generation of uncorrelated random scale-free networks. "Physical review E: statistical, nonlinear, and soft matter physics", Febrer 2005, vol. 71, p. 027103-1-027103-4.